See home values and recent market data for YOUR neighborhood! Just complete the form below for your free Denver Home Prices map download! 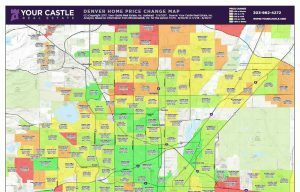 Every quarter we are proud to bring to you the latest Denver Metro Price Change Map. This tool is created and developed by Your Castle Real Estate to give you a clear sense of current real estate trends in each metro Denver neighborhood: it is a snapshot of Denver home prices as well as other important real estate market factors. For the first time, we can look inside each neighborhood and see what the real estate market looks like at a hyper-local level. That way, you can make a better decision whether you’re buying, selling or investing. Here’s how to read the map. Pick a neighborhood that interests you, say Five Points. There has been a 13 percent price increase in the past year, and the average sold price was $560,000. Five Points had only 62 sales in this time period, and currently there are only 9 active properties for sale. The neighborhood had only 1.7 Months of Inventory (MOI). What does this tell us about Five Points? It tells us that prices have been rising in the past year due to low Days On Market (DOM) and increasing prices, and the inventory is very low which favors sellers. With only 1.7 MOI (6 months of supply is a balanced market) this is a hot neighborhood. Let’s look at another neighborhood. In Chaffee Park, there has been a 22 percent rise in home prices in the past year. The average sale price is $339,000 and during the previous 12 months there have been 88 sales. Currently there is only 1 active property and only 0.4 MOI. What this tells us is that Chaffee Park, like Five Points, is a strong neighborhood with rising prices and low inventory. Check back quarterly for the latest, pinpointed and significant neighborhood statistics Denver home prices. Prepare yourself to sell in your specific neighborhood’s market, research prospective neighborhoods for your next home, or set yourself up for a rental property in a profitable part of town!